With Chanukah just hours away, I can’t think of a better time for two new cookbooks to make their way to store shelves. 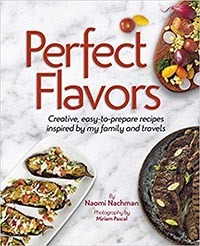 Whether you are looking for a great gift or just want to switch things up in your own culinary repertoire, both Perfect Flavors by Naomi Nachman and The Aishes Chayil Cookbook, a project of the Aishes Chayil postpartum recuperation center in Kiryas Joel, are overflowing with yummy possibilities. If you’ve ever had the pleasure of meeting Naomi Nachman, the first thing that hits you is her unique blend of warmth and openness, qualities that are evident throughout every page of her second cookbook. No stranger to the world of kosher cooking, Nachman’s recipes appear frequently in print, and her bubbly and engaging personality make every recipe come to life on “Table for Two with Naomi Nachman,” which airs weekly on the Nachum Segal network. That approachability is evident throughout Perfect Flavors, with mesmerizing photography by Miriam Pascal, another shining star of the kosher culinary world. While this volume is as much a gastronomic adventure as it is a cookbook, taking you through flavor profiles that range from the exotic to the nostalgically familiar, there is nothing here to intimidate the home cook. That any one of us can produce drool-worthy dishes comes through loud and clear; photographs of perfectly styled food share space with things you might find in your own kitchen – roasting pans with baked on scars that never seem to go away no matter how hard you scrub, a not-quite-perfect quiche sporting the cracks that happen in everyday life and a tarnished and weathered spoon sitting alongside a steaming mini-crock of soup. As always, I enjoy a cookbook that gives me stuff to read in addition to the recipes, and Perfect Flavors doesn’t disappoint. The intro is full of informative pointers on things like smoked salt, a finishing salt with (you guessed it) a distinctive smoky flavor, and the importance of both a positive attitude and a willingness to try new foods as essential cooking skills. Cook’s tips and variations are sprinkled throughout the 130 recipes, offering advice as well as an incentive to go out and experiment a little on your own. I highly recommend getting a pen and paper (or taking notes on your smartphone) as you turn the pages and plan your Shabbos meals or the menu for your Chanukah party – there is so much here to love. Beer battered broccoli with a cheddar and parmesan dipping sauce are fantastic Chanukah fare, as are the fried goat cheese and butternut squash salad with a maple dressing, the show stopping salt-crusted whole branzino, easy to prepare roasted eggplant parmesan that involves no breading or frying, and raspberry cheese latkes. If you want to celebrate the festival of lights with a non-dairy menu, try the brisket fries drizzled with garlic mayo, eggplant stuffed with falafel and Israeli salad, the hassle-free crockpot onion and flanken soup, pulled lamb pizza topped with a mint-parsley-basil mayo and a stunning grilled vegetable board. No matter whether you go for meat or dairy, be sure to check your diet at the door and end your meal with Nachman’s truly incredible lemon meringue pie donuts, though I highly recommend the chocolate martini and the microwavable s’mores mug cakes for true chocoholics like me. Of course, there are still other recipes that beg to be made no matter what time of year. 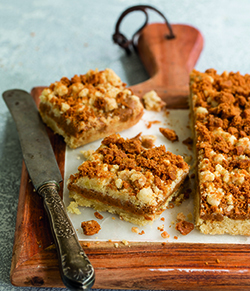 Having grown up in a house where nothing gets thrown out, the cereal crunch cookies, which use the crumbs in the bottom of the cereal box that no one wants to eat are a genius idea as is Nachman’s quizza – a cross between pizza and quiche. And don’t forget to try the overnight corned beef which cooks for hours in the oven before being slathered with a brown sugar and ketchup glaze. It’s hard to say no to this kind of fun and innovative cuisine and, really, why would you want to? Call it a kimpeturin heim, a postpartum recovery center or a mommy and baby resort, I confess to not knowing what Aishes Chayil was before seeing an ad several weeks ago for this cookbook filled with mnu items served at this highly popular recuperation facility for new moms. Clearly I am in the minority, because within one day of The Aishes Chayil Cookbook’s release, Feldheim Publishers reported that its entire first printing had completely sold out. I am grateful to have gotten my hands on what may very well be the only review copy of this highly anticipated book. Given that its clientele consists of new mothers recovering from childbirth, the nutritional content of its cuisine is a high priority at Aishes Chayil, but taste and presentation are equally important as part of the facility’s five star experience. With lavish gourmet meals and around the clock tea room serving up irresistible treats, the staff found themselves bombarded with recipe requests from guests – you don’t have to be a new mother or live in Kiryas Joel to be mesmerized by this cookbook. Clocking in at 322 pages, Aishes Chayil is loaded with health tips and practical advice, and each chapter is prefaced by two informative pages tackling topics including artful presentations, suggestions for a better fast, the importance of protein, a primer on oils and how to eat dessert without totally trashing your diet. 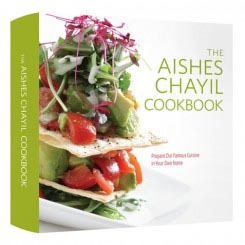 But as always, it’s all about the recipes and finding new foods to bring to your own dinner table and Aishes Chayil doesn’t disappoint with 200 taste tested recipes and accompanying photos that range from heimish favorites to contemporary cuisine. What to expect? Get ready for healthy, low fat, vegetarian sliders packed with vitamins and reimagined sloppy Joes, cooked up with ground chicken and served in an acorn squash shell. Indulge your decadent side with yogurt and granola parfaits that masquerade as an indulgent appetizer or dessert, but loaded with fruit, calcium and flaxseed – far more virtuous than they seem at first glance. Prepare to pounce on healthy mains like Chilean sea bass topped with avocado, nectarine, tomato and mango salsa and salmon and vegetable kebabs. 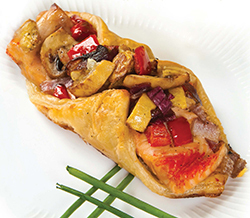 Cashew chicken served in a puff pastry shell and taken to the next level with the addition of cubed pastrami and sherry will have you wowing your guests, who will be equally enchanted by the simple beauty of sautéed fresh snow peas and pearl onions. Surrender to the classics, including decadent kokosh cake and outrageous brownie bars that are dead ringers for those Reisman’s ones that everyone loves and be sure not to miss out on the no bake cheese cake pops, creamy goodness enhanced with a hint of lemon and drizzled with Rosemarie chocolate and an almond nut crunch. Last but not least, get a sticky note and tag the heirloom tomato salad featuring fresh mozzarella, baby spinach and basil leaves, definitely a recipe you will want to make in the summer when fresh tomatoes are at their peak. While Aishes Chayil is currently sold out on the Feldheim website, you can try your luck on Amazon or in Jewish bookstores, some of which have a few copies available online and, hopefully, more in stock on store shelves. nd if you can’t get your hands on Aishes Chayil just yet, write up an IOU, wrap it up in a pretty box, slap a bow on it and mark mid-January on your calendar, when the second printing will have vendors restocked. Best wishes to all of our readers for a very freilichen and an equally delicious Chanukah! I developed this recipe for one of my kosher.com videos. Throughout my travels, people stopped me to let me know how much they love it. If you prefer the texture, you can use the Biscoff Smooth Cookie Butter instead. In a shallow dish, combine mayonnaise, mustard, salt, pepper, garlic powder, wasabi sauce, and lemon juice. Add salmon and let marinate for 30 minutes. Meanwhile, heat oil in a sauté pan over medium heat. Add onion and sauté until soft, about 5-7 minutes. Add peppers and mushrooms and sauté until vegetables are soft, about 10 additional minutes. Season with salt, pepper, and garlic powder to taste. Place puff pastry squares diagonally on prepared baking sheet. Top with a piece of salmon and a spoonful of sautéed vegetables. Pinch together dough from two sides (optional: pinch together all four corners). Brush with egg and sprinkle with sesame seeds. Bake until pastry is golden, about 25 minutes. HEALTH NOTE: Many people peel the outer skin of the mushroom to have a pretty, smooth surface. Don’t! You’ll lose a lot of flavor. Rather, clean off the outer residue with a brush or damp paper towel. Never soak mushrooms in water. They’ll act like a sponge, absorbing water and losing flavor.